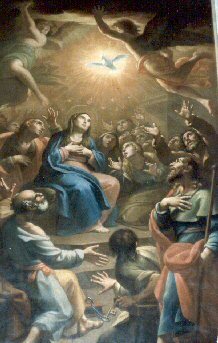 Today's solemnity commemorates the event which occurred 50 days after Easter when the Holy Spirit descended upon the Apostles and Mary, firmly establishing the Church and invigorating the Apostles with the zeal to proclaim the Gospel to the farthest ends of the earth. Pentecost, however, is not a holy day private to Catholics or even Christians. Pentecost originated as a Jewish harvest feast - it's one of the three major feasts of the Jewish calendar. Of course, for the Apostles, the harvest would not be wheat crops but the first believers of the Gospel. What we know about that first Catholic Pentecost comes from the Acts of the Apostles as we heard it proclaimed in the first reading. The Holy Spirit descended upon the Apostles and appeared to them in tongues of fire and they were filled with the Holy Spirit and began to speak in different languages as the Spirit enabled them to proclaim. In an instant, the confusion at the Tower of Babel was replaced with the unity of understanding found in the Spirit. How different the tenor among the Apostles, who, just 53 days prior to this event on the evening of the Last Supper, were a band of confused and scared men who abandoned their Lord and Master in His moment of gravest need and allowed Him to suffered a horrific death. What a difference their new life in the Spirit had made for them. The personal largesse of each of the Apostles and St. Paul is captured in visual art form in the main nave of the Cathedral and Basilica of St. John Lateran in Rome, Christendom's mother church and the Pope's cathedral. In the main nave, you will fine 13 statues depicting the Twelve and St. Paul in grand style. Each of the statues shows each of the Apostles to be of superhuman physique - any one of them looks fit to play middle linebacker in the NFL. And while we know that these men were not built like superheroes, they had faith like superheroes. Although they possessed no advanced degrees in theology or any classroom pastoral training, they had the best of teachers (our Lord) and they had the power of the Holy Spirit animating their work. They did not know what today is known as private Catholicism. Private Catholicism is a disposition or attitude that says, "I am a good Catholic. I go to Mass every Sunday and to Confession every so many months and I don't commit major sins and I believe all that the Church teaches. However, I don't see the need to talk about the Faith to others because after all, it's only THE GOOD NEWS. For me, it's embarrassing to talk about the Faith - I don't want to offend anyone or impose my beliefs on them!" What if the Apostles had this attitude at Pentecost? Would we have known names like Beethoven, Mozart, Palestrina, Michelangelo, Bramante, Fra Anglico, Louis Pasteur, Blaise Pascal, Leonardo DaVinici, Dorthy Day, Bl. Junipero Serra (the father of California), Bl. Theresa of Calcutta, Pope John Paul II? Would the Church have been the developer and the genius behind the modern system of economics (based on monastery bartering systems) or the system of modern diplomacy, or Western music (all rooted in Gregorian Chant) or even the Julian or Gregorian Calendars? We cannot afford to be private Catholics! We must be evangelical! This task of evangelization takes many forms, too many to mention here but the obligation is all the same: we cannot be on the sidelines anymore! This can only be accomplished through the Holy Spirit. The power of the Holy Spirit cannot be overestimated. It is the same Spirit that pours forth the virtues and the gifts of the Holy Spirit into the soul of every person who is baptized either as an infant or later on in life. And, it is the same Spirit whom the priest invokes at every Mass during the Eucharistic Prayer. The Holy Spirit gives power to our sacraments and makes Jesus present in the Church today as He has from her inception, 2 millennia past. I would like to close with a very practical example of how the Holy Spirit works in our lives, if we let Him. One of the things that the Holy Spirit helps us to do is to pray. The Holy Spirit helps us with the grace of prayer so that we pray as we ought, for in Romans, St. Paul states that we do not know how to pray as we ought. 1. Adoration - we come before the Blessed Sacrament - our Lord really and substantially present in His Body, Blood, Soul and Divinity in the Eucharist and we adore Him for the simple fact that He is God. We don't ask for anything - we simply adore God for His very being, acknowledging that without Him, we would not even exist. 2. Contrition - a prayer of profound sorrow for one's sins and a desire to reform one's life. When one gazes upon God, one should see one's inadequacies, faults, sins and flaws, that only God can truly heal and reform. Contrition should also elicit great hope (trust) that God can do this reformation in us. 3. Thanksgiving - a profound gratitude for all that God has done for us, even the times that He has permitted us to suffer, as a means of drawing us closer to Himself. Even if you have had a tough and difficult life, you can still be thankful that God can and will use those times to unite your suffering to His on the Cross - the way of suffering is the sure way to heaven. 4. Supplication - this is the prayer that we often altogether do too much. We ask and ask and ask, at the expense of not adoring or thanking or expressing contrition. The irony is that God already knows what we want and what we truly need. We ought to spend less time asking God to give us x or y and spend more time asking Him for the grace to accept whatever He wants to give us - that it be according to His most holy will and for our true good. St. Augustine once said that while it is proper to ask God for things or to meet our needs, we must always do so with a posture of humble acceptance of His will. St. Jose Maria Escriva used to say that if you really want to give God a good laugh, tell him YOUR plans. How often do we enter prayer only interested in asking for favors? Do we seriously take time to first adore and then express contrition and thanksgiving before asking for anything? Only after we have acknowledged God's greatness, our sinfulness and our gratitude for His presence in our lives can we approach Him with requests. As we continue the celebration of this Solemnity, we entrust ourselves to the Blessed Mother and we ask her to help secure for us the grace of prayer - that we will learn how to get caught-up in that constant song of love between the Father, Son and Holy Spirit. We pray that the Holy Spirit will renew in our lives a desire for prayer and the perseverance to pray with greater fervor.